This collection represents a unified collection of data to provide an overview of the CCCU and its institutions. This data will continue to grow in scope and distinction with the yearly addition of data and reports from the Collaborative Assessment Project (CAP). We will contribute to a stronger organization by better serving the data needs of our membership. To request individual data with ranking against CCCU norms and that of other sectors, please complete the request form. Academic freedom is the right of the professor to a degree of freedom in teaching and research, subject to professional standards of competence, relevance, and respect. It is a foundational value of the academy. 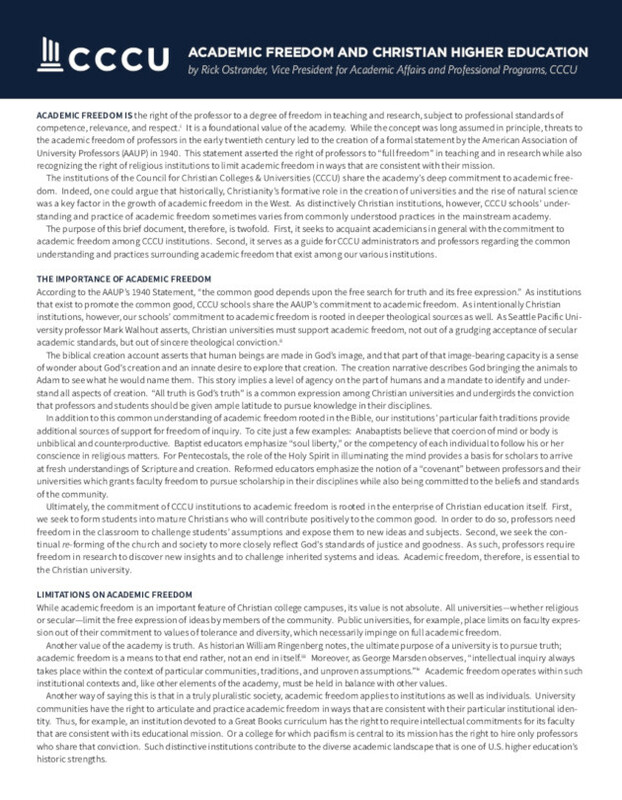 CCCU institutions share the academy’s deep commitment to academic freedom, and this document serves as a guide for CCCU administrators and professors regarding the common understanding and practices surrounding academic freedom. The CCCU conducts annual comprehensive surveys of both faculty and administration salary and benefits to give governing member institutions benchmarks for their institutional strategic planning. All CCCU governing member institutions are invited each September to participate. Both regional and national results are sent to presidents by the end of December. This service is provided free of charge for governing member campuses. Due to the confidential nature of this survey, results are only available to participating presidents. The most recent survey was completed for 2017-18. If you need a copy of this survey, please request this directly from your president. If you have any questions regarding the forms or reports, please contact Nita Stemmler at nstemmler@cccu.org. This is the 33rd in an annual series of research reports conducted by the CCCU. The purpose of this study is to provide member colleges with comparative and longitudinal salary data. The research has traditionally been based on information compiled for the AAUP, appearing in Academe each spring (for the current study, from March/April, 2017). For those U.S.-based members not represented in AAUP, the author used data surveyed by the CCCU. Due to changes in CCCU membership categories, only governing members are included in this survey; however, we have added a new appendix based on Carnegie Classifications that allow us to include collaborative partners and affiliate members. The CCCU conducts an annual survey of president compensation packages on member campuses to give governing member institutions benchmarks for their institutional strategic planning. All CCCU governing member institutions are invited each September to participate. Results are sent to the president by the end of December. This service is provided free of charge for governing members. Due to the confidential nature of this survey, results are only available to participating presidents. The most recent survey was completed for 2017-18. If you need a copy of this survey, please request this directly from your president. Each year, the CCCU collects retention and graduation rates about all U.S.-based CCCU member institutions in order to provide our members with a profile of retention and graduation statistics for the CCCU as a whole. No individual institutional information is posted; only the aggregate data is compiled for this survey. This is the 33rd in an annual series of reports on tuition and fees at member institutions of the CCCU. The purpose of this study is to provide the CCCU membership with comparative, longitudinal data to assist institutions in their external benchmarking. This report is based on data collected by the College Board (“Trends in College Pricing 2017”); their findings appeared in the November 2017 edition of The Chronicle of Higher Education. All 109 U.S. institutions listed on the CCCU website as “Governing Members” as of November 2017 have been included in this report. Next year’s survey will include all U.S.-based institutions. In preparation, we have included Collaborative Partners and Affiliate Member tuition figures for this year.